Low Profile Rear Light Bar, designed to fit on FJ's that DO NOT HAVE a roof rack. The rear lights feature a fluted reflector to give more of a flood effect, providing a shorter and wider light beam than our front lights, which give you a much longer beam. This works very well when backing up, or when you want to see what is behind you, and to the sides. 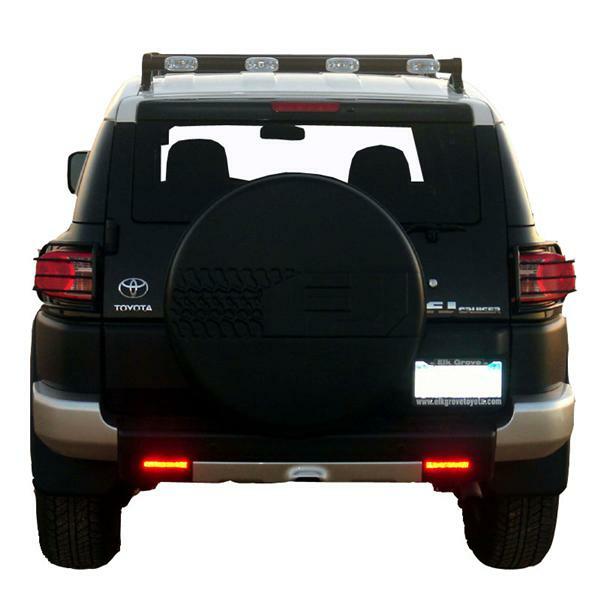 This light bar includes two specially designed 8" black aluminum tracks that attach to the top of your roof, utilizing the factory threaded mounting holes that all FJ�s are equipped with. These tracks can hold a front light bar, a rear light bar, and if you wish, a center rack bar that turns the whole assembly into a heavy duty roof rack. Plus 1 Light Bars and billet bar mounts are constructed of strong 6061-T6 aircraft aluminum, and powder coated black for long life and a custom look. Manufactured with integrated light mounts for a cleaner, smoother look. All of our light bars use PIAA 55-watt �Extreme White Plus� blue halogen bulbs, which are rated at a 110-watt output to really light up the night. Comes complete with four PIAA lights, bar mounts, all hardware, wiring harnesses with relays, and easy installation instructions with pictures.